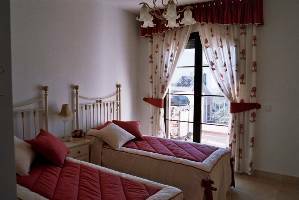 Luxury Penthouse - beautiful comfortable 5 star acccommodation! Penthouse Casa Romero is a spectacular and luxurious property with ivory inlaid marble flooring and built in climate control air conditioning throughout. Exquisitively furnished and maintained to a very high standard - a very elegant and comfortable property! BREATHTAKING PANORAMIC VIEWS enjoyed from every corner - definitely the best location on this exclusive Golf Resort! 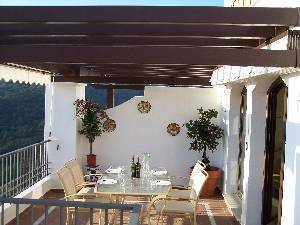 Two very sunny terraces with wall mounted awnings to offer shade, if and when required over the dining area. Large glass and sand coloured wrought iron table with matching chairs – the perfect spot to enjoy a glass of wine or steak cooked on the gas barbeque. Two matching sun loungers with wheels for easy maneuverability. Beautiful pool set admidst sub tropical gardens surrounded by the most amazing views - immediately in front of Casa Romero. For your convenience there are sun loungers, parasols and showers (all free of charge). 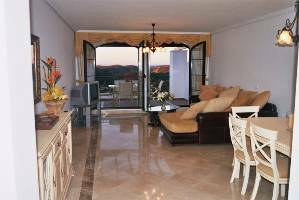 Casa Romero has a fully fitted kitchen with granite work surfaces and bosch appliances including hob, oven, dishwasher, microwave and fridge/freezer. A full range of glassware, crockery, pans, cutlery etc. Separate utility with washer/tumble dryer and ironing facilities. Master suite – with king sized bed and wrought iron bedstead with four poster ivory canopy. Sumptuous soft furnishings voiles and drapes. (Safe for valuables). Lovely private terrace with fantastic views. Luxury fully tiled ENSUITE BATHROOM with twin basins inlaid in oak vanity units, heated towel rail, bidet and wc. Enormous Sitting Room with comfortable Leather Suite with beautiful mediterannean coloured soft furnishings, drapes and voiles. Dining Area with large creamy lemon dining suite. Large colour TV with DVD and CD Player and Telephone with internet access. 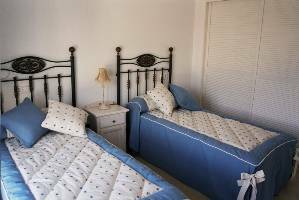 Two further twin bedded rooms each with a full range of wardrobes and fabulous coastal and mountain views. The first one is furnished with a soft rose pink and white with complimentary wrought iron bedsteads and the other crisp blue and white again with matching wrought iron bedsteads. Underground garage – lift and stairs to property. Built in security system with video. Shutters to all windows for added privacy. This beautiful property sits majestically on the Golf Course with fabulous views over the Mediterranean coastline and foothills of the Sierra Blanca mountains. A truly privileged spot! Ideal for families or golfers. Cot, high chair and baby sitting service available. Towels and linen provided. 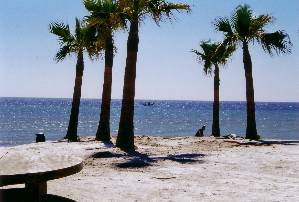 This Resort is one of the most prestigious residential areas on the Costa del Sol, with spectacular views to both the mountains and the Mediterranean coastline. Meticulously designed it is considered to be one of the prettiest and most luxurious residential resorts in the area. 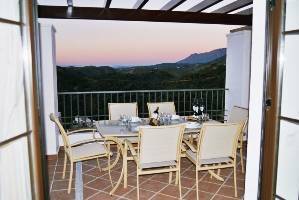 Situated in the heart of a unique natural environment with an 18 hole Golf Course and a wide range of other facilities with include:- Pro shop, Driving Range, Fitness Centre, Sauna, Square, Paddle Tennis, Pools, Children's Play Area, Bar and Restaurant with outside terraces - all within a few minutes stroll of Casa Romero!